Scalambrino, Frank, Adam Riggio, Emma Craddock and Susan Dieleman. “The Future of the Enlightenment?” Social Epistemology Review and Reply Collective 4, no. 2 (2015): 33-36. Heath stresses that what started out as the desire to allow everyone their own voice and their own opinion has led to a belief that everyone is also entitled to their own facts. Often understood as a “post-truth” movement, Heath emphasizes that citizens today simply “opt-out” of “the truth-telling game” (5). Whereas, among other things, he criticizes conservatives for being too “angry” and operating at a “gut level” (84), he criticizes liberals for being “misologists” (211), i.e. being guilty of fallaciously characterizing and hyperbolically attacking rationality. Despite its well-known strengths, liberal democracy as an institution has been seriously eroded by such persistent problems as demagoguery, short-termism, simple-minded populism, the excessive influence of money and the role played by special interests … the Chinese system of meritocracy makes it inconceivable that anyone as incompetent as America’s George W. Bush or Japan’s Yoshihiko Noda could ever get to the top (336). Notice, then, how Heath sees Enlightenment 2.0 as a program for sustaining a “representative democracy” against “vulgar romanticism” and the ills noted by Zhang. Although Joseph Heath sees his vision of a new Enlightenment as sustaining representative democracy, his dependence on large-scale social engineering as the only possible means to build institutions that encourage popular rationality is inherently anti-democratic. Much of the book amasses a large amount of empirical evidence gathered through multiple social science disciplines, all of which marshalls his argument that humans are incredibly irrational most of the time, and easily manipulated by corporate interests and the politics of demagoguery to fall into utter stupidity. Because we are so easily manipulated, the vast majority of people are incapable of running their own lives. Heath distinguishes himself from the boosters of authoritarian regimes, as Frank notes. But his declaration that a more rational society does not require authoritarian control of every aspect of our lives does not erase his conclusion that state social engineering on massive scales and with intrusive ubiquity is the only way to rig our environments to encourage popular rationality. In this, Heath is radically out of step with the culture of the 21st century, which has lost faith in the trustworthiness of the state to carry out social engineering with any success, honesty, or even preserving the basic interests of citizens. Previous state-based attempts at social engineering on large scales have been disastrous failures. As well, given the clear abuses of power and terrifying violence that states today commit against their people (ex. NSA mass-spying, the militarized police crackdown on peaceful protesters in Ferguson, civil wars across Africa and the Arab world, Russia’s imperialist border games, China’s everyday oppression, the totalitarian monarchy of the DPRK), I no longer believe that citizens can trust the state to safeguard their interests at all. However, I think there’s a solution that preserves the freedom of humanity from pervasive authoritarian control of every aspect of our living environments “for our own good” while also improving our rationality. Heath discusses how much easier it is for corporations to think rationally than individual people because corporate institutions organize people into groups to think. He never considers, in this section, the possibility that people could organize themselves into associations, thereby achieving the same purpose. These voluntary associations of neighbours, friends, and colleagues would be able to plan their lives rationally, understand the mistakes they make by trusting their intuitions at improper times, and prevent their manipulation by corporate or state powers who act against the people’s interests. They could network with other voluntary associations to arrange collective actions. It would be difficult to form these networks, but once they began, I think they would snowball quite effectively into a serious social movement, especially given our current technological ability to connect disparate groups of people. Throughout Enlightenment 2.0 Heath appears to overly rely on psychological evidence and arguments, rejecting the sociological dimension of political engagement. In the process he recreates, reinforces, and constantly repeats the archaic and unhelpful dichotomy of emotion versus reason. Therefore, Heath entirely neglects the central and positive role played by emotion in mobilising and sustaining collective action, as demonstrated by social movement studies. Given that Heath wishes to propel a more collectively driven theory of exercising reason, it is puzzling that this body of work remains invisible throughout. I can’t help but wonder whether he falls into the trap he warns us to avoid, namely that of confirmation bias. Language matters. I am disturbed by Heath’s ableist use of the terms crazy, sanity, and insanity, to describe political behaviours in a way that reinforces yet another unhelpful and damaging historical dichotomy that should have been discarded long ago. While Heath argues for an ‘Enlightenment 2.0’ it would seem that he has not actually strayed too far from original Enlightenment attitudes and ideas regarding such dichotomies of emotion/ reason, madness/ sanity and effectively reinvigorates the worst elements of this historical period instead of reinventing the best. Additionally, considering the book begins by arguing that progressive politics needs to reinvent reasoning as a way to combat the pervasive influence of the right’s emotional appeal, much of Heath’s arguments and solutions seem to be inherently anti-progressive. In fact, his suggestion of institutions invoking the so-called ‘nudge’ theory is an approach implemented in the UK by the current right-wing Tory party as part of the coalition government! I strongly agree with Adam [Riggio] when he questions the suitability of institutions to provide the basis for popular rationality and with his proposed solution of voluntary associations. Such a model is particularly appealing given the current social and political context where institutions have lost the trust of the people and citizens are disillusioned with the current political system. Heath thinks we need another Enlightenment—one that returns reason to a politics that is overrun by intuition. This is Enlightenment 2.0, however, and so is different than the first, locating rationality in institutions rather than individuals. Institutions can use “kluges” to encourage us to be rational in the face of our evolutionary disposition to act intuitively. Instead of allowing institutions to exploit our tendencies to take less now rather than more later, or to consume what’s in front of us regardless of the amount, for example, we can put rules and regulations in place that work with our best interests rather than against them. Heath dedicates Chapter 8: “Dripping Wine and Blood: The Misology of the Modern Left” to exploring how irrationality is not an issue unique to the conservative right, but has plagued the progressive left as well (though I wouldn’t blame anyone for being skeptical of a chapter that appeals to Ayn Rand to set up the problem!). He focuses on various efforts by left-leaning thinkers to differentiate instrumental reason from other, non-instrumental varieties: the Frankfurt School thinkers, who responded to the horrors of WWII by recommending a return to “objective” reason, feminist theorists, who seek a less adversarial (i.e. male) version of reason (though Mary Daly is hardly representative of feminist efforts to interrogate the maleness of reason! ), and environmentalists, who Heath thinks have “done everything possible to undermine the authority and prestige of science over the course of the past fifty years” (how Heath makes the leap from environmentalists to anti-vaxxers in the following paragraph remains a bit of a mystery). 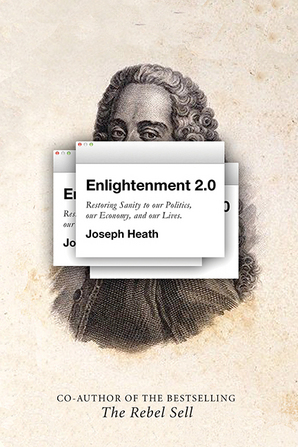 However, Heath’s criticisms of these efforts points to a larger series of issues in the text, such as those already pointed out by my colleagues: his reinstantiation of traditional Enlightenment dichotomies—in their problematic language, nonetheless!—and his neglect of the ways that civil society might contribute to a “new enlightenment” (it is a remarkable feat to so thoroughly critique the Frankfurt school, only to turn around and recommend deliberative democracy as a solution to the ills diagnosed!). In addition to these issues is the fact that Heath never provides a satisfactory definition of “reason,” assuming that it is simply an instrument in the service of maximizing self-interest. That reason might have additional functions never seems to cross Heath’s mind (perhaps he failed to “see the negative” here?). Relatedly—and this is in part what those “irrationalist” progressive critics worry about—is that instrumental reason provides no way to interrogate the ends it serves. Heath suggests that politics is about problem-solving in the context of large and complex societies, but never considers that there might be deep disagreement about which problems ought to be solved, and it’s not clear that “thinking slow” can be of any help here.